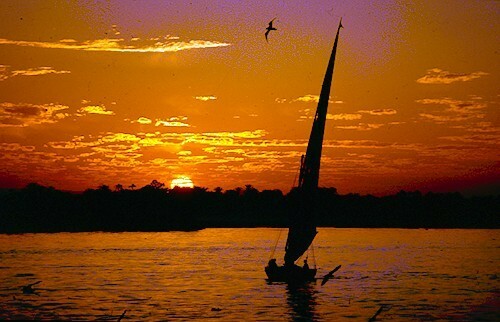 The most hassle-free and the most exhilarating way to see Egypt is by Nile steamer. These luxurious boats with air-conditioned accommodation provide a floating base for side trips to the sites and tombs. The four- to six-day cruise between Luxor and Aswan is probably the busiest, but addicted Egypt lovers prefer to take the more leisurely three-week journey from Cairo to Aswan, or Aswan to Cairo, which takes in just about every site in the land. In Cairo, you'll visit the Giza pyramids and Sphinx, the great mosques and the marvellous museum where the treasures of the boy king Tutankhamen are displayed, along with a rather large pair of his fine linen knickers. The Cairo city markets are a paradise for the bargain hunter. Intricate leatherwork, jewellery, ridiculously- cheap cottons and linens, heady essence of lotus, pale purple onions and rosey guavas are all piled high in baskets in cool doorways, or spread indulgently on trestle tables for you to pick through. Here, bargaining is obligatory. Haggling is a way of life throughout Egypt, except in the Cairo gold markets where the gold price is set each day by the government, and haggling is a definite 'no'. From Cairo, you'll also visit Memphis, the ancient capital of Lower Egypt, and its necropolis, Saqqara, with its massive step pyramid and temple complex. Once on board your cruise boat, the country's history unfolds. Villages complete with donkeys, children, goats and mud huts provide a mobile frieze as you ghost past. Great limestone cliffs loom above and an occasional white mastaba tomb, with its characteristic domed roof, punctuates the arid banks of the river. Luxor - or Thebes, as it was called long ago - boasts two of the most celebrated temples in the country, the great complex of Karnak with its celebrated hypostyle hall, and the smaller, though still enormous, Temple of Luxor. Karnak Temple offers a stirring son et lumiere in the evenings. This is well worth visiting early in your travels, as it puts the whole history of Egypt in a nutshell, giving you a general background to this desert realm. Cruise boats moor alongside the Luxor temple, so it's easy to hop off and walk along the promenade, vising the many shops along the river, or perhaps indulging in a sweet, strong Egyptian coffee. The local ferry takes you across the river to the Valley of the Kings, the Valley of the Queens, the Valley of the Nobles, and Hatshepsut's temple at Dier el Ban. Hatshepsut was a formidable female Pharaoh who travelled throughout the region, and to faraway places, wearing a fake beard so that she would be taken seriously. The Pharaonic tombs are spectacular, particularly those of Seti I and Rameses VI, but it's also well worth visifing the valley's neighbouring village, Dier el Medina, once the home of the royal tomb-builders. Here, the tombs are much simpler than the Pharaonic excesses in the Valley of the Kings, but no less colourful. Sunsets are spectacular, particularly in the Luxor region, where the sun sinks in a blaze of scarlet and gold behind the Valley of the Kings. Incidentally, if any of the tombs you want to see appear to be closed, find the gaffir, or tomb guardian, who'll be lurking nearby, offer him an Egyptian pound or a packet of cigarettes and you'll find that doors open, literally! Aswan nesties at the base of the old English dam. Various temples (including the 'drowned' temple of Philae, recently reconstructed on an island), quares, sailing jaunts to the cataracts on feluccas and a visit to the botanical gardens on Kitchener Island are all enjoyable options. One essential excursion is an early- morning flight to Abu Simbel, the great monuments to Rameses II and his wife Nefertari which have been rebuilt on dry land after a mind-boggling engineering feat to move them from the threatening waters of the dam. Rameses must have had an ego as big as the Nile itseif, as the temples are gigantic, festooned with huge statues of the lad himself, and marginally smaller ones of his favourite Nubian wife. They are glorious, if over the top, and remain as startling testament to both the pharaoh?s megalomania and modern engineering. Some visitors to Egypt spend their days in search of ancient lives, while others sit on deck with a gin and tonic, or local wine, and watch the world go by. Either way, there are certain sites which are not to be missed. The pyramids and the Sphinx are almost obligatory while the son et lumiere performed in the chilly desert evenings (you'll need a sweater) will not necessarily delight everyone. The temples of Karnak, Luxor, Edfu, Philae, Abydos, Denderra and Kom Ombo should thrill most, while Esna may only entice because of the town's good market.